With speeds up to 5Gbps, USB 3.0 is fast becoming the new standard in data-transfer technology for PCs and laptops. However, some computers only feature 10/100 Ethernet ports while Macbook Airs and often Ultrabooks don’t feature Ethernet ports at all. 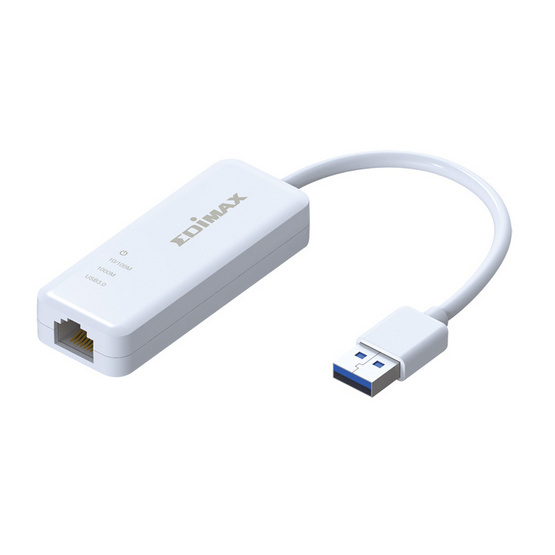 Existing USB 2.0 Gigabit Ethernet adapters are limited by the USB 2.0 maximum data rate of 480Mbps while our USB 3.0 adapter can reach speeds of 5Gbps. Upgrade existing 10/100 Ethernet connectivity to super-fast Gigabit speeds or introduce USB 3.0 true Gigabit Ethernet connectivity to an Ultrabook or Macbook Air. The EU-4306 supports USB 3.0, the newest specification of the USB standard which specifies a maximum data transmission speed of 5Gbps. Up to ten times faster than the existing USB 2.0 standard which is restricted to a maximum speed of 480Mbps, USB 3.0 enables the full capacity of 10/100/1000Mbps Gigabit Ethernet to be reached through an existing USB port with no need to install a Gigabit Ethernet card.